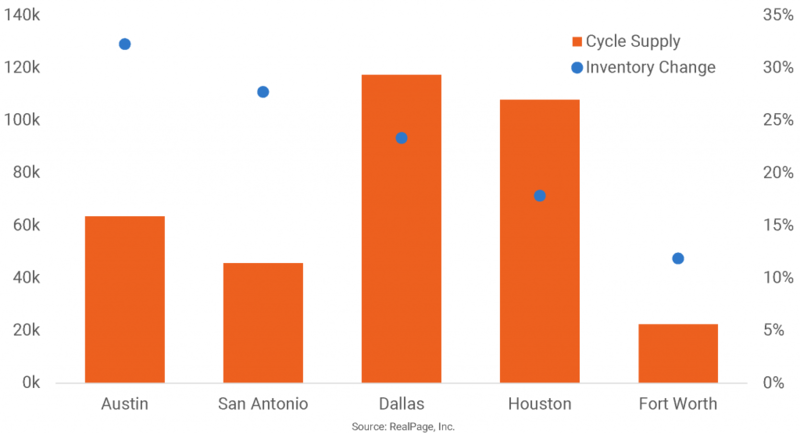 Of the five major Texas apartment markets, all but one has seen an inventory increase well ahead of the national average in the current economic cycle, which started in 2010. Austin, San Antonio and Dallas were among the nation’s top 10 inventory growth leaders among large markets in the current cycle. Austin’s apartment base has seen the biggest increase, with nearly 63,400 new units growing inventory in the state’s capital by about a third in the past eight years. San Antonio has seen more than 45,600 units delivered since 2010, a volume that has grown the existing base 27.7%. Dallas saw more sizable block of completions at about 117,000 units, but the inventory increase was a bit lower at 23.3%. Houston just missed the top 10, with delivery of 108,000 units in the current cycle, pushing the apartment base up by 17.8%. Still, the number of units delivered was second highest nationally, behind only Dallas. The only major Texas market to see inventory growth below the U.S. average was Fort Worth. With a little over 22,000 units completed in the cycle, the apartment base has grown 11.9%, a bit behind the national average of 12.8%.